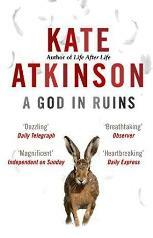 Kate Atkinson’s A God in Ruins takes its title from Ralph Waldo Emerson’s assessment of the state of Man once innocence is lost. It tells a story about Teddy Todd (and also his family and friends) from childhood in the 1920s through service in World War Two , post-war marriage and domestic life and finally into extreme old age almost in the present day. The telling, however, is decidedly nonlinear and skips between different periods – one is tempted to say randomly but the shifts are not done in a way that confuses the reader. Episodes from different times in Teddy’s life are often cleverly linked by small physical details: a mysterious stain on an old photograph is casually explained away the first time we hear of it but its real and grimmer nature is revealed in a flashback sequence which appears many pages later. With the exception of events which actually happen to Teddy, many of the major incidents are reported from two points of view – that of Teddy as a concerned observer and also that of the person (wife or child or grandchild) to whom it did happen. It might be said that the narrative involves rather too many distressing and unusual events for any one person or family. For instance, Teddy’s own childhood is oddly hijacked by an aunt who writes a successful series of children’s books based on the exaggerated re-telling of some of his juvenile exploits. Teddy goes on to have a very eventful war as a bomber pilot; and after this he seems to spend the last two-thirds of his life observing and trying to deal with multiple misfortunes which befall his family. And yet Atkinson makes all this quite believable; and, on reflection, I could recognize that most of the dramas surrounding Teddy’s life have had (maybe somewhat milder) counterparts in my own. As a result, I found Teddy reminding me, by turns, of both my own grandfather and my father. More alarmingly I began to detect in him traces of the man I shall probably become as younger generations with different attitudes and expectations grow up around me! A God in Ruins recently won the Costa Novel Award – Atkinson’s second such prize after winning the 2013 award for Life after Life (which features some of the same characters). The writing is vivid and layered enough for me to have been still as engaged and surprised during the last hundred or so pages of this 500-page novel as I had been in the opening chapters. The scene, towards the end of the book, in which Viola, Teddy’s daughter, stumbles around York amid drunken hen and stag parties is very funny – until it slips astonishingly deftly into being very moving. And as one who has read a good many books about Bomber Command – fiction and non-fiction – I should also say that Atkinson’s accounts of flying a Halifax over enemy territory are as evocative as anything I have previously come across. Viola imagined herself as if … [her] soft organs and tissue had calcified at some point in the long-ago past. The Petrification of Viola Romaine. Good title for something. Her life, she supposed. But who would write it? And how could she stop them? As you got older and time went on, you realised that the difference between truth and fiction didn’t really matter because eventually everything disappeared into the soupy, amnesiac mess of history. Atkinson is certainly interested in playing on the boundaries of truth and fiction; and in this very enjoyable novel the reader will find that, by placing stories inside other stories or by telling and re-telling certain episodes or by making her characters interact with real-life events, she is going further and exploring the nature of truth within a work of fiction.